This photo has a funny story…I grew birdhouse gourds last summer, then dried them over the winter in my garden shed. Just yesterday, I pulled them out to wash in my screen and let burnish in the sunshine. Brio watched the entire process with much curiosity. I set them out in the sun with a full basket and came out about 30 minutes later. Brio was fast asleep with his head resting on the crook of the gourd right by the main screen. 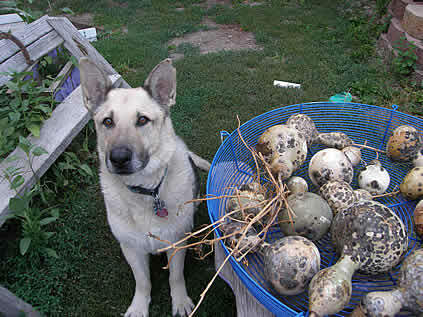 When he heard me, he picked up the gourd like it was his best and newest toy! He was so proud. Unfortunately, since yesterday a few have been rearranged to new areas of the property. Chin props, shepherd rattles or doggie toys? Not sure which but he seems to be enjoying his pilfering game when I am out of sight. I snapped this picture just this morning minus a few of the gourds that have been redistributed to the yard! He looks pretty proud of his architectural accomplishments!